Elegant diptych of polychrome large vertical format woodblock prints, left and center panels of a triptych made in 1856 by the artist Utagawa Kunisada II (二代目歌川国貞), depicting two sophisticated courtesans oiran (花魁), in the company of a very young kamuro (禿), enjoying cherry blossoms on a terrace overlooking the Sumida River (隅田川). 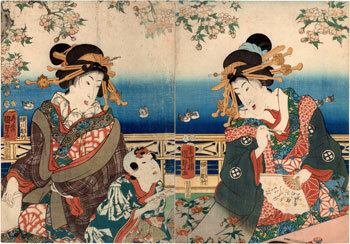 The woman on the right is holding a fan on which she has just executed a refined calligraphic exercise with a brush. 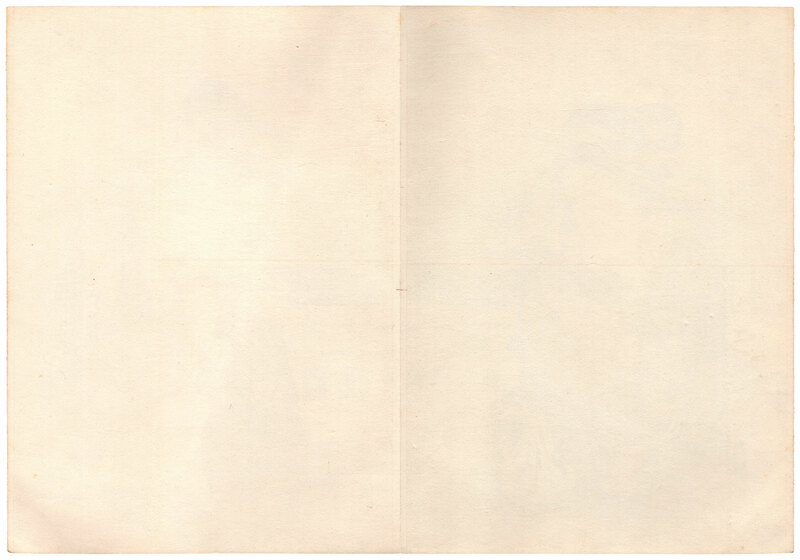 The title of the work, made in collaboration with the publisher Iseya Kanekichi (伊勢屋兼吉) and the carver Yokokawa Takejiro (横川竹二郎), is visible on the missing right panel and is "A bustling hill by the Sumida River" (隅田川岡の賑ひ). 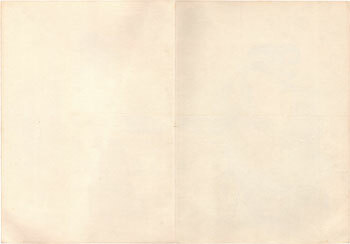 The two prints on Japanese washi paper (和紙) are glued together by a relining carried out on the back with a thick cardboard and have the right signs of the time, especially on the upper part of the sheets.